Conceptual and data artist Rachel Ara graduated with a Fine Art BA from Goldsmiths College where she won the Burston award. Today, she combines her manual skills with her background in programming and analytics to create nonconformist artworks with a socio-political edge that often incorporates humour and irony. In 2016 Rachel won the International Aesthetica Art Prize for ‘This Much I’m Worth (The Self Evaluating Artwork)’ Prototype. The artwork is connected to the internet and so becomes part of the world wide web. Complex algortihms called the ‘endorsers’ run nightly on external servers using the data gathered together with extensive data mining from the media and internet to re-evaluate the work. The endorsers then post the new value back through the internet overnight where it is then retrieved and displayed by the artwork. The artwork therefore calculates its own value. The prototype developed initially into ‘The Ancestor’ and subsequently into the full scale version that was exhibited at the gallery in 2017 as part of Controlled Realities and later in a warehouse in South London. 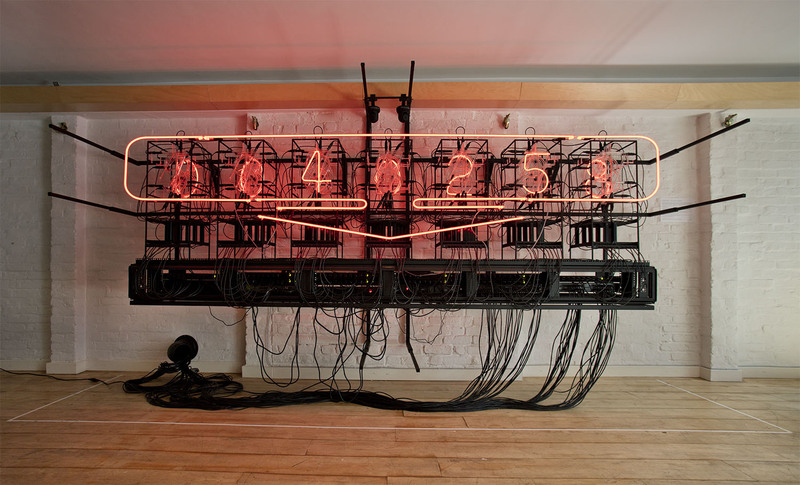 ‘The Ancestor’ is a sculptural piece by data artist Rachel Ara exploring our relationship to machines and data and plays with notions of arts form and function being mutually exclusive. Originally the work was the prototype for Rachel’s large-scale ‘This Much I’m Worth’ installation, which was first exhibited at Anise Gallery in May 2017. In contrast with ‘This Much I’m Worth’, ‘The Ancestor’ is not powered by a set algorithm, instead producing its neon numerical output using a randomised computer program. 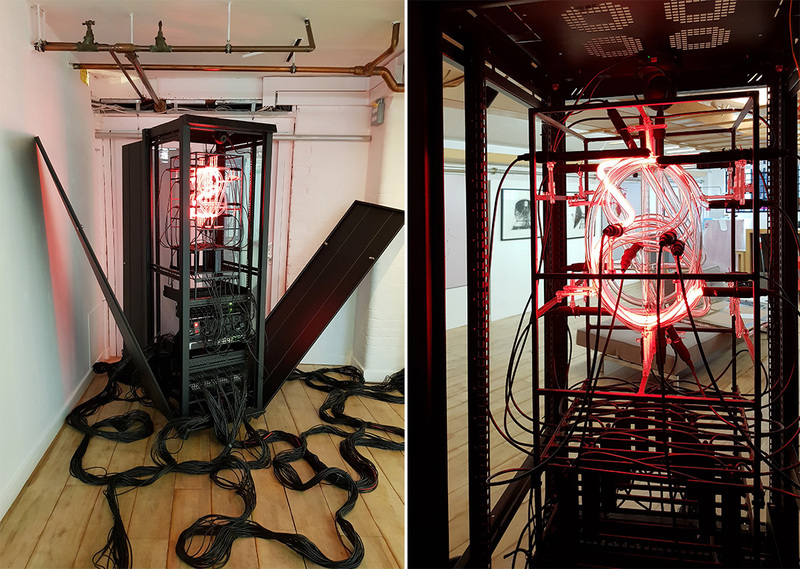 Being run by a single regular 13AMP plug, Rachel’s background in computer programming has been used to highlight the difference between its technical appearance and the realistic function of an artwork. 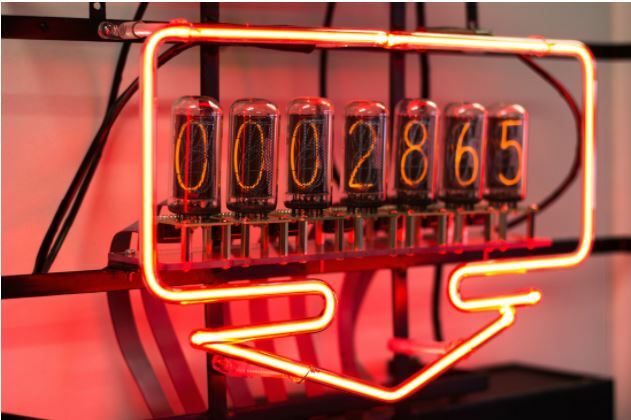 Below the neon figures is the computer producing the numbers. 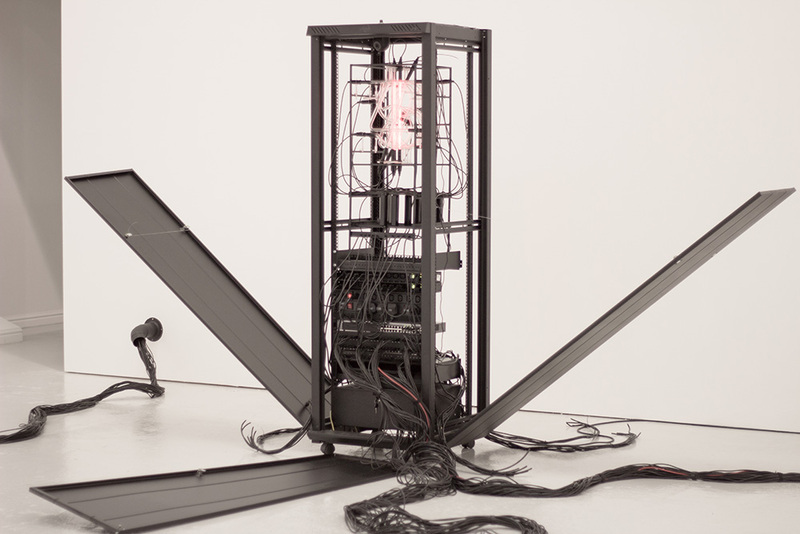 Given that the viewer is not aware of how this computer functions, the artist wishes to draw attention to the inaccessible nature of various technologies we use on a daily basis, including the internet and our phones. Merging the technological world and a human one, we notice that the sculpture is of human height bearing neon figures the size of a human head, so we are faced with an abandoned piece of technology that seems to have a life of its own, albeit as an artwork. Emphasis is placed on this status, and Rachel asks us to consider our relationships with machines around us, and question the trust we place in them. In 2018 alone The Ancestor has been exhibited at the London Art Fair, The V&A and at Anise Gallery. At over 4m long and 2m high the sculpture’s scale has substantially increased from that of the prototype. – The artwork displays its sales value (GBP) that is calculated nightly offline by complex algorithms called ‘The Endorsers’. Alongside the prestigious Aesthetica Art Prize and Lumen Art Prize, Rachel was also elected as Royal West Academician, long listed for the Art Laguna Prize and was invited to become a member of the Royal British Society of Sculptors. Rachel is a Near Now Fellow, awarded to pioneering artists working in technology. In October 2017 she took up residence at the V&A as the VARI Artist in Residence.